Every spring we should take the time to teach students to take care of our Earth and our environment. Nature is an amazing treasure, and it is our job to take care of it! Go grab your plan book , and let’s plan your Earth Day theme. Don’t forget to grab the FREE Earth Day Vocabulary Posters in this post too! Fill the bookshelf with books about the Earth, recycling, saving resources, caring for the environment, garbage and various habitats (forests, rivers, ponds). My favorite non-fiction series is Helping the Environment by Charlotte Guillain, which includes Caring for Nature, Saving Water, Cleaning Up Litter, Saving Energy, and Reusing and Recycling. My favorite fiction books are The Earth Book by Todd Par and 10 Things I can do to Help my World. Kids are fascinated with garbage and recycling trucks! To build on this interest, I made a Recycling Truck Letter Sorting activity for them. Students pick a card and stamp the letter on the matching side. Letter stamps make any activity more fun! Earth Day Read, Build, Write has students making their sight words with recycling! Students pick a sight word, build it in the recycling bin and write it at the bottom with a dry erase marker. 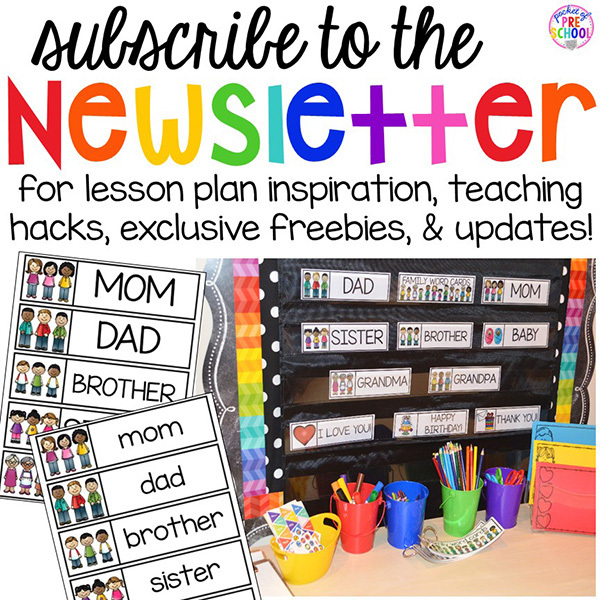 You can laminate the pages or just slip them into a dry erase pocket. Most students may not understand what water pollution is or may not have ever seen a recycling plant or a landfill before. These full page FREE Earth Day Vocabulary Posters will show students what these things actually look like. Keep them out and refer to them throughout the theme. Go grab your FREE posters HERE or by clicking on the photo. To spice up the Earth Day writing center, I added NEWSPAPER for students to write on and use to decorate their writing. It is a way for students to practice reusing something instead of throwing it away! I also added Earth Day vocabulary cards, Earth Day writing paper, skinny markers, colored pencils, crayons, scissors, paper and glue. There is always a basket with previous themed vocabulary cards and family word cards (grab HERE for FREE). Since we are learning all about the Earth, why not take the learning outside?! We did “write the room” outside! I placed the Earth Day vocabulary cards all over the ground. Students then went around writing the words on their Earth Day paper using a clipboard. Super simple and so much fun! My students LOVE connecting cubes! I made an Earth Day Syllable game where they clap the syllables and build a tower with the corresponding number of cubes. At the end, they have a visual representation of what words are short (small towers) and what words are long (big towers). 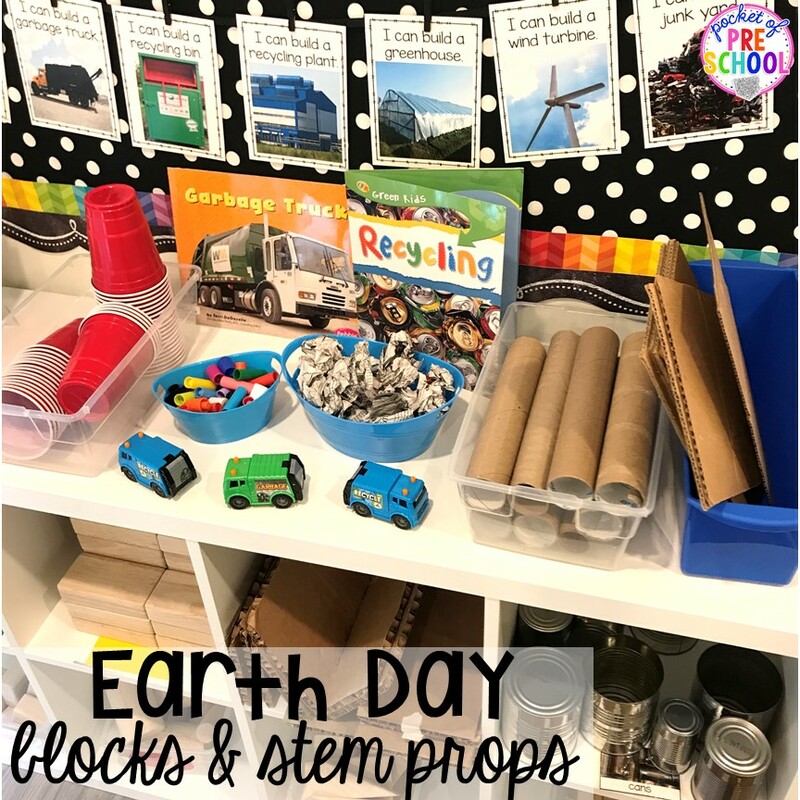 In the blocks center, I added Earth Day STEM Challenges and fun props like cardboard, a small bucket of crumpled up paper, cans, cups, lids, cardboard, recycling trucks and garbage trucks. This little learner made a recycling plant using unit blocks, recycling trucks, cardboard, crumpled up paper and lids. She told me that one side was for paper and one side was for plastic! Litter walks are a must for any Earth Day theme. Grab a paper bag, go outside and students can help clean up litter around the school. Earth Day Building Numbers in ten frames is an easy and fun way to develop one to one correspondence and number identification. Students pick a number card, identify the number and count out the corresponding number of gems. My younger friends used a single ten frame board and cards from 1-10. This way everyone can play the same game at their own level! To keep the Earth Day theme going, have students make patterns with rocks, green gems and blue gems. You can make a pattern and students can extend it. 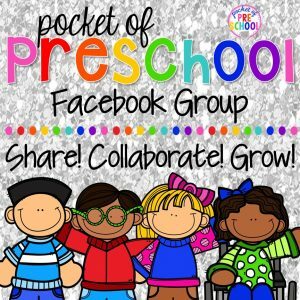 Students can also make the start of a pattern and their friend can extend it, or students can make up their own patterns. Student surveys are always a hit in my classroom. There’s something about a clipboard that makes them feel powerful! Students can go around asking each other if they recycle at home. Students can make tallies or dots (with dot markers) on the graph. Earth Day I 2D Shapes I Spy helps students learn about shapes. They can identify them, draw them and learn about their attributes. Quick trick: make each set of cards a different color this way if they get mixed up students can easily tell the set apart! Spring is usually when I start teaching about 3D shapes. These Earth Day 3D Puzzles are super fun! Students match the 3D Earth to a real life 3D shape. Earth Day art is super easy! Find some newspaper, cut, glue, and paint! It’s open-ended plus students are reusing materials and developing fine motor skills. They will make a beautiful bulletin board display too. Coffee filer Earths are just beautiful! Mix up some green and blue water and cut out a few hearts. Students drop the colored water onto coffee filers to create the Earth. To help students see the colors, we like to use the white lids of some of our Sterilite containers for art trays. This looks gross, but I promise it’s not! I took a few food wrappers and washed them. Then I grabbed some clean plastic cups, straws, paper towels and plastic silverware. Finally, I made the water “polluted” using brown and yellow liquid watercolor. I also added some fish. It’s a sensory experience for students to be able to see what it’s like to play in the water with litter. It’s a way to help our little learners see how pollution effects the environment. At circle or during play, talk about how they think the fish would feel if they lived in water that is polluted. Then the next day I fill the sensory table with “clean” water (water with blue liquid watercolor) so students could compare the two. If you have time, make a comparison chart about clean water and polluted water. Teach students all about the impacts trash can have on the environment and how to recycle at the science table. Make pollution sensory bottles, sort different types of recycling and try to clean up litter. Grab my Recycling and Trash science unit HERE from my TPT store for all the printables, activities and parent notes. I hope your plans are filled with tons of fun center and activities for your Earth Day theme. Want all the math and literacy Earth Day printables? Go grab theme HERE! Just print, prep, and teach! Grab my Spring STEM I Can Build pack which includes Earth Day, Spring, St. Patrick’s Day and Easter themed STEM challenge cards HERE.